You remember that bucket list you made last New Year’s after a fair few number of drinks when you decided that this was your year of travel? It’s like God wanted me to most definitely strike out South Korea off mine before the end of this year. 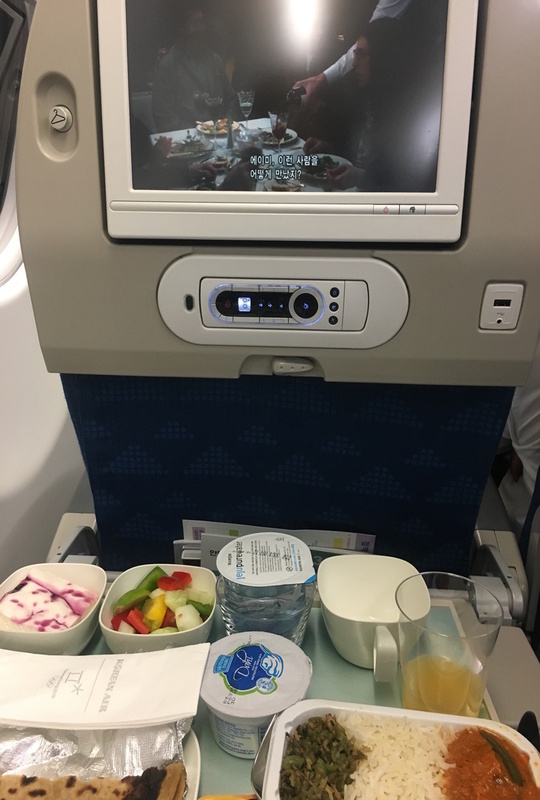 My trip to Seoul, South Korea has been nothing short of a magical ride; beginning with finding myself on Korean Air on the second day of its commencement of flights from Delhi to Seoul. 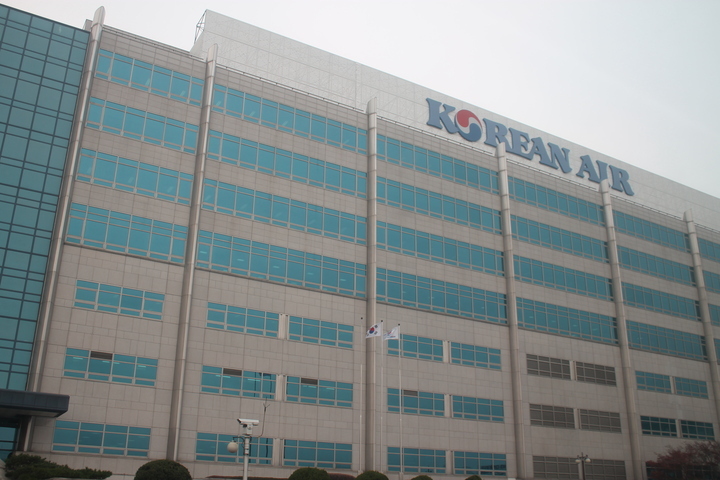 Korean Air has been around for 47 years and connects 129 destinations in 46 countries. Factual overloading aside, the hospitality of Korean Air would definitely be something I would cherish for a long time to come. With plush interiors and a more than fabulous First Class, Korean Air's A330-200 was every bit worth the wait to begin operations from Delhi. The leisure flyer (and mind you, mostly on a budget) has a great economy seating where I especially love the fact that tall people like me still get ample of leg space. For business travellers and holidayers alike, I cannot think of a better news that you can now fly directly from Delhi to Seoul, all at such well timed flights that you never end up wasting a day travelling. 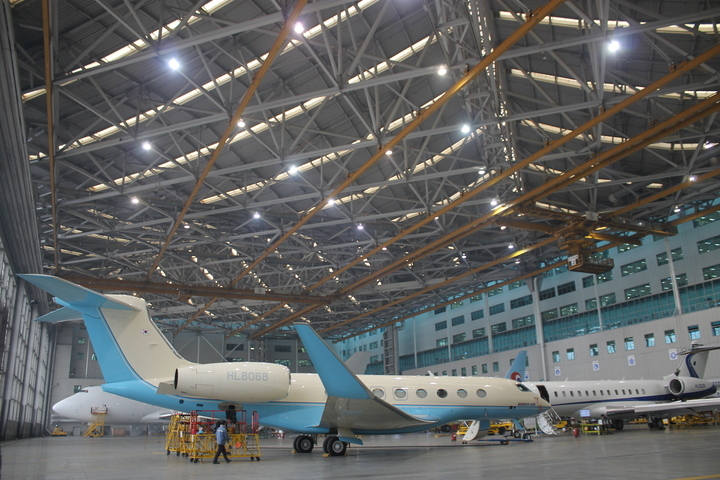 We also had the privilege of visiting the Korean Air hangar in Seoul during the course of the trip and for an aviation noob like myself, it was quite an eye opener to see all that went into smooth, seamless operations of such a vastly successful airline. 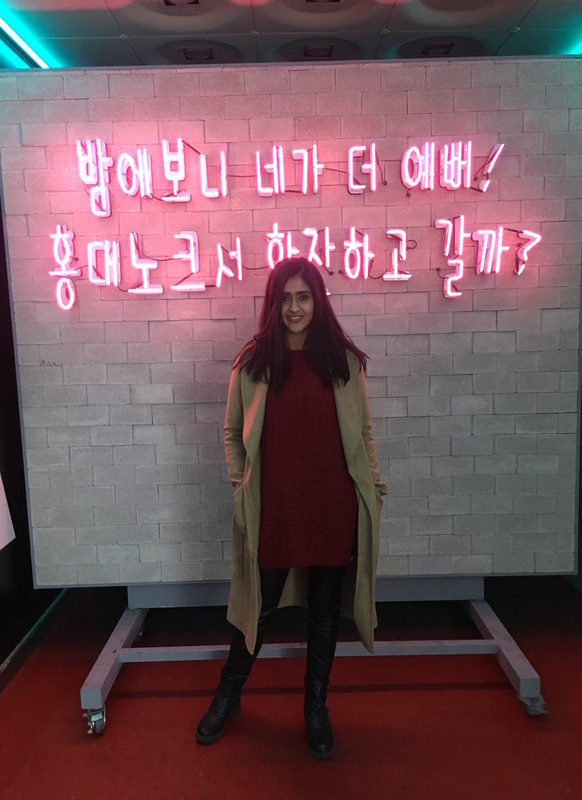 So thrilled to share with you the top 10 things you should definitely do and not miss out on, on a holiday to Seoul, South Korea. Luckily for me, Acumen Overseas- GSA for Korean Air in India and Korean Air ensured that most of these things were covered in an itinerary chalked out for me. The remaining came out of my own research and trial and error. 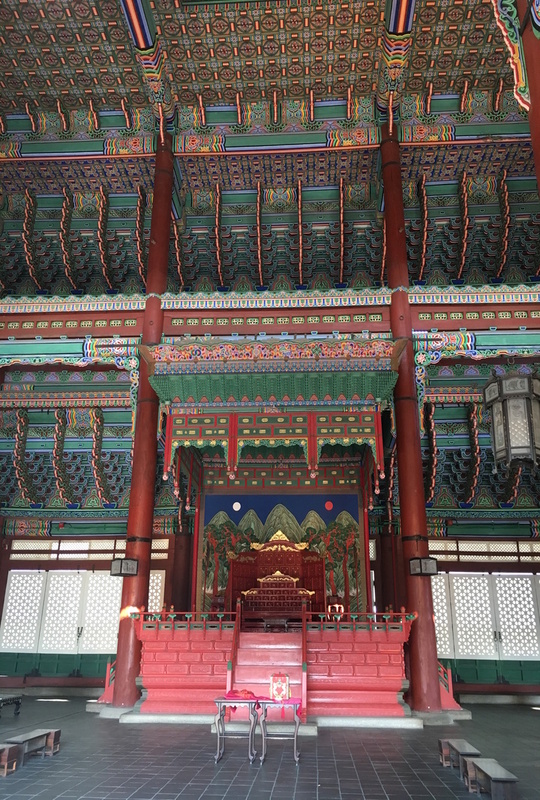 Gyeonbokgung Palace: Gyeonbok palace as it is more popularly known is the largest and most magnificent of the five palaces in Korea and is the perfect place to get an insight into the architecture, design and life of the Joseon Dynasty. This is where the guard changing ceremony takes place which holds its own grandeur of course. The palace is beyond stunning and if you had a guide as thorough with his history as ours, well you’re in luck. You can book your tickets online in advance or even book at the spot. 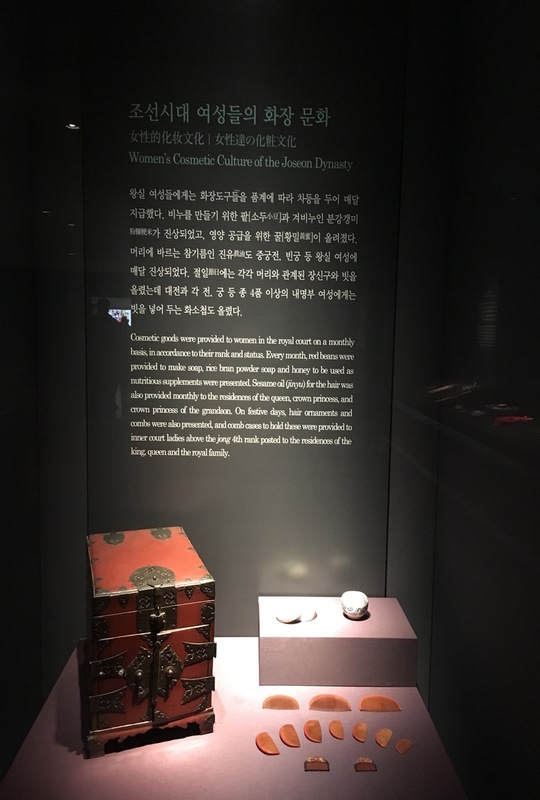 National Palace Museum of Korea: I have to admit that I’m a bit of a history buff and a museum geek but that shouldn’t come as a surprise to you given my old travelogues. 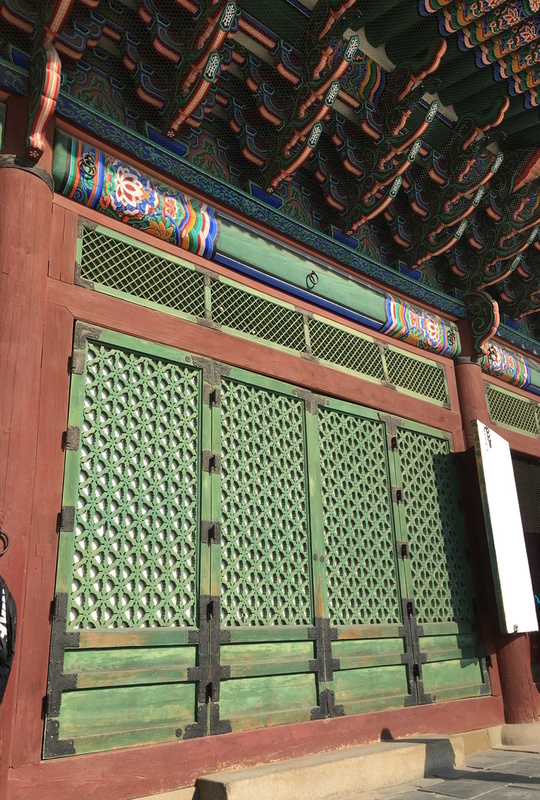 The National Palace Museum of Korea is a no miss for two big reasons: FREE entry and the fact that it is right next to the Gyeonbokgung palace. Everything from historical texts to scriptures and artifacts of the many Korean empires is housed here. I had quite a few moments of revelation and since the museum is not too big, a few hours would suffice to cover this and the National Folk Museum located next to it too. DMZ or the Demilitarized zone between North Korea and South Korea: This little beacon of peace and hope between North Korea and South Korea is a must visit. The disturbed relations between the north and south are documented in the form of an AV followed by the visit to the third secret tunnel which was dug by NK to attack the south and is now a part of the demilitarized zone. By the means of a mono rail, going down the cold, harsh tunnel definitely gives you gooseflesh. The Korean war of 1950 was incidentally something that left the South of Korea indebted to India for their military medical support offered. Many a mines have been uncovered as a means for North Korea to attack South Korea and as a part of this tour, they arrange for a stop at the Dora Observatory from where on you get a glimpse of a village which is a part of the DMZ with a lot of flora and fauna and people residing alike. It also includes a trip to the station wherein hopefully the Unification train from South Korea to North Korea would ferry people one day. 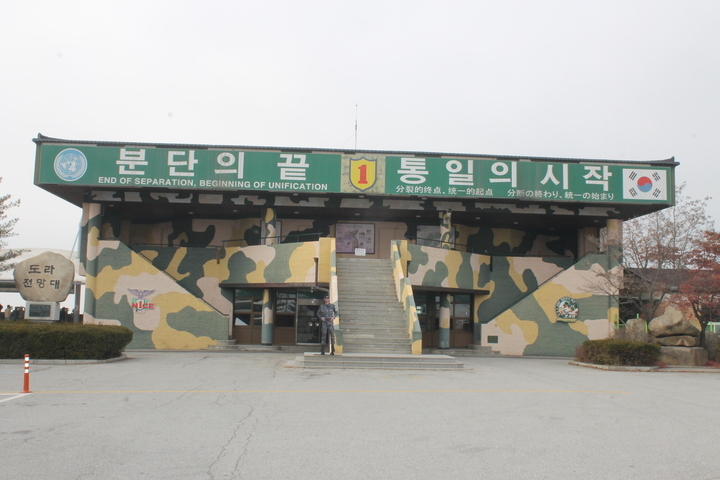 Important to remember that the visit to the DMZ requires a special permit and a compulsory ID proof (preferably passport) on you at all times when you visit it. 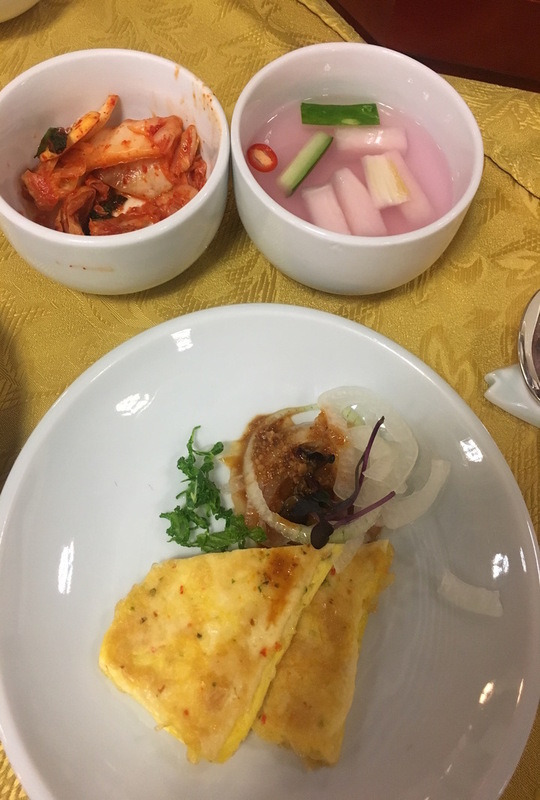 Korean Food: There is absolutely no point of making a trip to a beautiful country like Korea and missing out on the incredible local food it has to offer. An immense amount of sea food, great meat and fabulous desserts are a must have. Bibimbap is a hot stone pot that includes rice, veggies, eggs and meat that I personally love. Get one of those table tops where you can barbeque your own meat and try all kinds of kimchi and don’t forget to have it with a drink or two of Soju (the most popular alcoholic beverage made from rice traditionally and now possibly potatoes, that locals drink). There is honestly not one particular place I would tell you to look out for since almost every locality has its own small restaurants and little hole in the wall style places that serve some immaculate local food. Meoyong Dong: Korea is a land of beauty and skincare junkies and their love for plastic surgery aside, Meoyong Dong is the best place to shop all your crazy masks and haircare products from. Every big Asian brand from the Face Shop to Etude House has a store here (at great prices too) and they have all kinds of discounts and deals on at all points of time. Plus they give you tons of free samples and that is a big up from a shopper's perspective. This market also has an entire row of street vendors and food hawkers set right in the middle for people to eat and walk and shop, all at the same time. You can get anything from oysters to lobsters to a special kind of potatos on a stick and baked sweet potato here. Don’t miss the ’32 cms’ ice cream and the beautifully lit up trees during the festive season. It also has a beautiful cathedral that I could not take my eyes off. Psssst…the shops and vendors are open almost till 10 pm or 11 pm on most weekdays! 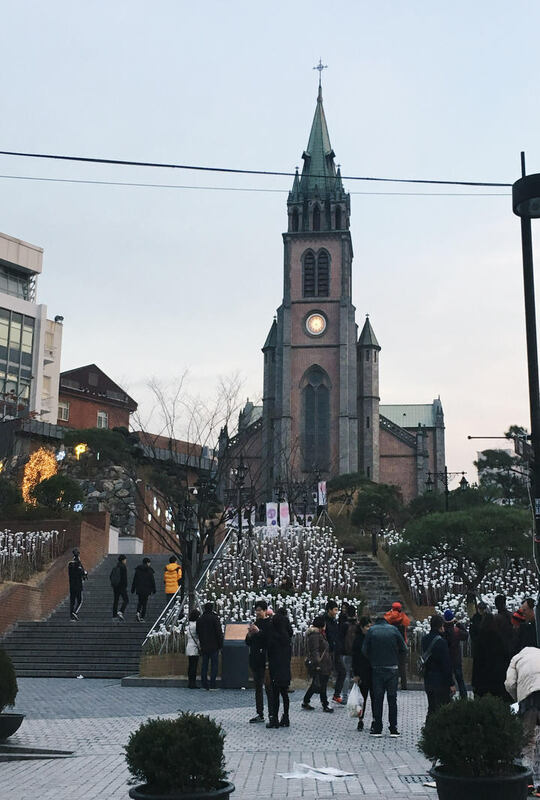 Itaewon: A serious popular spot with the expats, Itaewon was the most ‘happening’ area in Seoul that I came across in my time in Seoul. I would accredit it to the fact that I went there over the weekend and it had almost everything you could imagine. From a street, leading into alleys full of bars and restaurants that were filled to the brim with crowds spilling over to the streets to ample of shopping. The market stays open till late too and gives you enough opportunity to do street shopping and shop at the regular stores there till late. Love the fact that it has every kind of international food joint and some seriously adorable bars here. 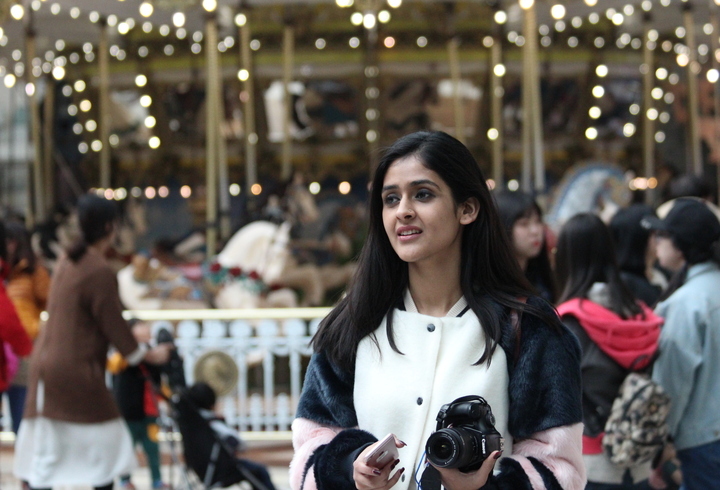 Lotte World: If you are the Walt Disney World kind of a person then the world’s largest indoor amusement park should obviously be high on your list of priority. Lotte World is just as magical with a gazillion rides, shopping arcades, larger-than-life stage performances, magic island and a large ice-skating rink. While the rides on a normal day have a waiting queue for at least 20 minutes, the restaurants, shopping arcades and some of the rides outside have relatively shorter queues. Insadong: There is no trip really complete without a whole bunch of souvenirs and artfully curated set of gifts for back home. While most things are slightly expensive here, Insadong happens to be the one stop shop for all things art and porcelain in Korea. If you follow my personal facebook page, you would have caught my live session from Insadong wherein I interacted with quite a few of you while showing you the sights and sounds of the souvenir shops, antique collections and art galleries of Insadong. All in all, worth the few extra thousand wons to buy a set of nice take-backs from here. 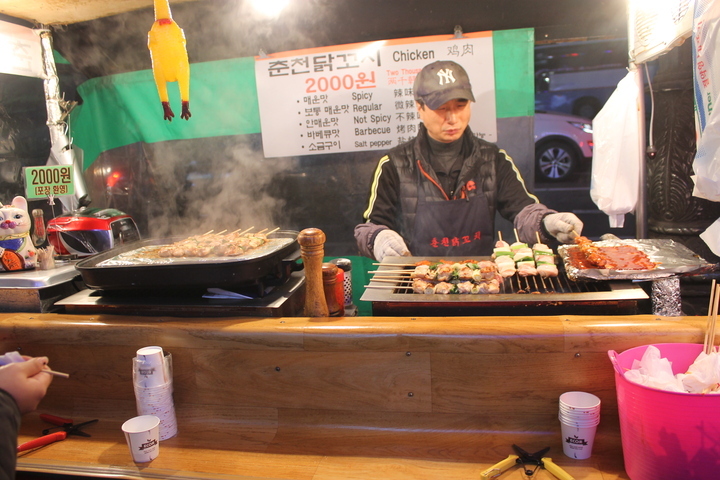 Also, a great place for some seriously good Korean street food. 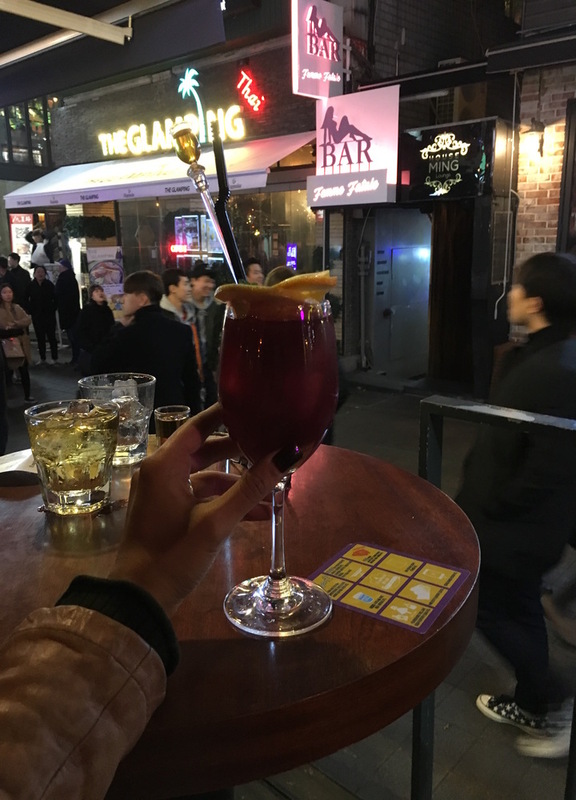 Hongdae: The area around Hongik University in Seoul is called Hongdae and is definitely on the radar of the tourists and locals alike when it comes to partying. While we made the mistake of heading there on a Sunday (Sunday is quite dead in the city), we still managed to find a few bars that were living up the acclaimed indie-music and hipster crowd scene. We went to one such underground bar and apparently the place also holds a lot of underground live gigs on other days. Make sure you head there on a Friday or Saturday. 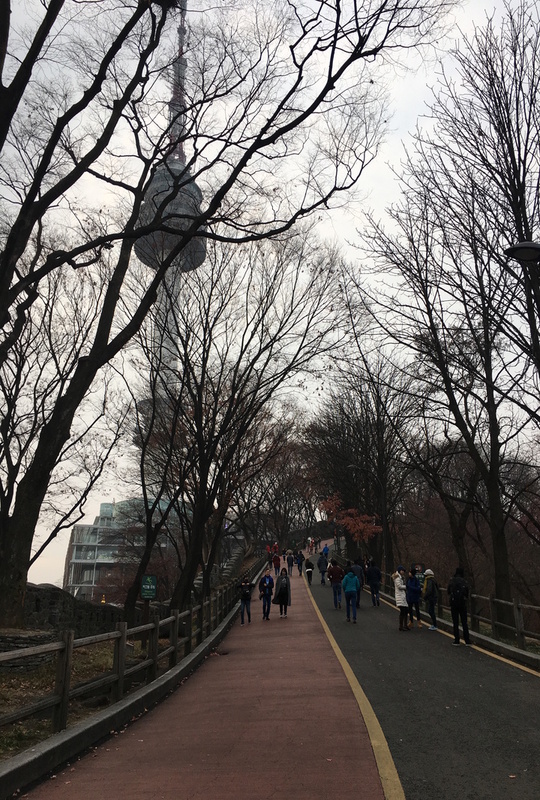 N-Tower: N-Tower or Namsan Tower as the full name goes is the highest point of Seoul. It is a communication tower built over a mountain and offers some of the best views of the city. Unfortunately, we didn’t find the best views on the day we went because of the thick fog so we hung around at the bottom and saw the love-lock bridge (much like the one in Paris, just smaller). The top of the tower also has a restaurant and a few souvenir shops. All in all, a great experience and one that offers a lot of opportunities for photography and if you happen to make your trip in the last week of March and first week of April, then the cherry blossom views with dots of pink everywhere will greet you. Definitely something to keep in mind while planning your trip. There are a ton of other things that I packed into my 3 day trip to South Korea and yet another few that I could not in this trip. 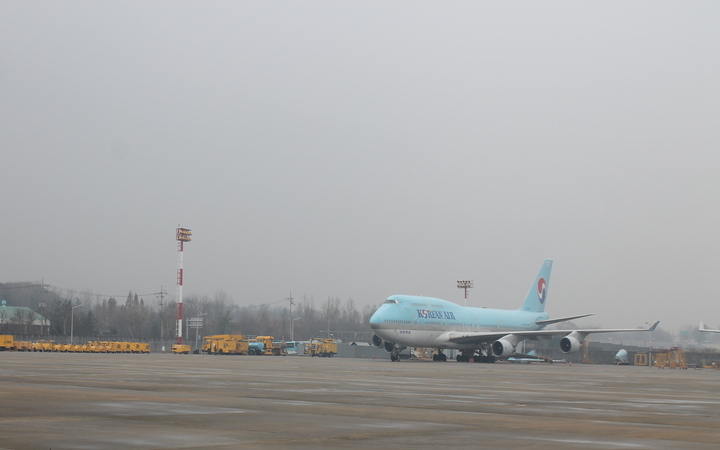 But hopefully now with Korean Air’s direct flight from Delhi, I’m going to be heading there again sometime. A special mention to Mr. Pukhraj S. Chug, Managing Director of Acumen Overseas- GSA, Korean Air and Mr. Sang Wook Han, Regional Manager, Korean Air for all the courtesies extended and a fabulous visit to Seoul. For any questions, queries, ideas on South Korea, Korean Air, my itinerary, don’t forget to get in touch. 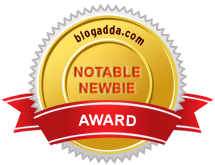 Its amazing how your travel reviews are so relatable as opposed to the ones that seem too expensive or too lavish and don't actually capture the essence of the city! I can totally imagine doing all these things! What about those who are looking for the budget travel, visit the ranikhet in India a beautiful place to explore the peaceful Himalayan views in winters with delicious International food.